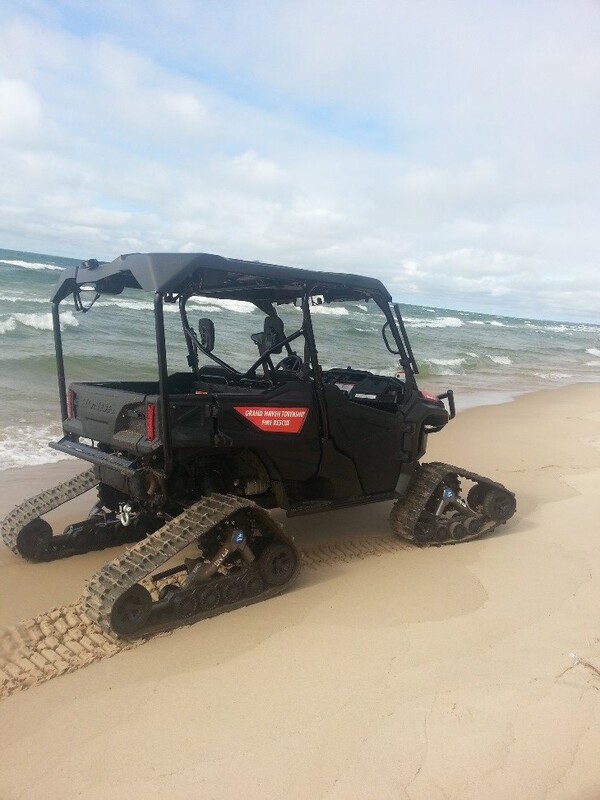 Grand Haven Charter Township operates a combination FIRE and RESCUE Department. Grand Haven Charter Township Fire/Rescue will be teaming up with Ottawa County Sheriff’s Office for the tenth annual Team 911 Academy, which will begin on Monday, June 18th and continue through June 22nd. This one-week program is designed for teens interested in a career in Fire/Rescue, Police, or EMS and it is impressive to note that many of the graduates have gone on to work for local police, fire or ambulance services – including 2 graduates that currently work for the Township’s Fire/Rescue Department. For more information please contact: David Peterson. The Grand Haven Charter Township Fire/Rescue Department is a full service department that has 7 full time and 24 part time staff. The Department provides a crew of 2 highly skilled staff around the clock that have an average response time of just 3 minutes and 10 seconds to all emergencies. The firefighters/paramedics leave the fire station within 30 seconds from the time that you call 911. Grand Haven Charter Township is 1 of only 3 departments in Ottawa County that staff their fire station at all times. Administration believes that staffing the station is the most important factor when it comes to saving lives and property. Grand Haven Charter Township Fire/Rescue is the only department in West Michigan to operate with non-transport Advanced Life Support license (Paramedics). This advantage allows the Fire/Rescue Department to provide advanced airways, life-saving medications, and state-of-the-art cardiac monitoring. In August of 2014, the Township Board sought approval for a 1.9 property tax millage that raises about $1.2 million annually for the Fire/Rescue Department operations and a capital replacement plan. Prior to the 2014 increase, the Department had operated on a 1.5 millage rate since 1985 (over thirty years ago). During this same period, the Township’s population has increased by about 84% and the number of emergency runs has increased by about 794% annually. The Department operates on about $1.1 million per year, while the remaining $100,000 of the monies collected each year is set aside for future capital equipment purchases, such as the replacement of a fire truck or rescue vehicle. The Fire/Rescue Department’s level of emergency medical care is higher than that of the other fire departments within West Michigan because of Advanced Life Support (ALS) given by the Paramedics responding to every call. The Department’s 64% cardiac arrest rate (that has occurred over the last 5 years, with the national average of cardiac arrest saves being under 10%) is a result of the highly effective ALS care. The unusually high save rate in the community is made possible in part by the quick response times, advanced new equipment, and dedicated training of the Paramedics and EMT’s of Grand Haven Charter Township Fire/Rescue. The Department has also had an extremely high fire suppression rate as well. Having staff at the station 24/7, allows the fire truck to leave the station within 30 seconds of the call, allowing the firefighters to extinguish the fire at an early stage before devastating loss can occur. The high level of training and advanced equipment has also allowed the Department to provide services to entrapped traffic accident patients. Many of the citizens are alive today because of both the quick and aggressive extrication techniques (i.e. Jaws of Life) and the highest level of medical care that is available in the pre-hospital setting. The staff at Grand Haven Charter Township Fire/Rescue believes that these exceptional results speak for themselves. The department’s apparatus includes 1 Paramedic/Rescue Truck, 1 Medical First Responder Truck, a seventy-five foot Quint, a Paramedic/Engine, 1 Tanker, 1 Brush Truck and a 2016 Honda UTV.